The Perilous Adventures of Jack the Dragonslayer is a series of Choose Your Own Adventure™-style sprite comics hosted on SmackJeeves.com and featuring sprites ripped from the Final Fantasy™ and Super Mario Brothers™ video games. The stories, characters, settings, and illustrations are mine, but the sprites used to create the illustrations are the work of the talented designers at Square Enix® and Nintendo®. Perilous Jack and the Frost Potion is Volume One of a five-part series called The Abduction of Princess Vasilisa. In this volume, Perilous Jack returns home from an adventure to discover that Princess Vasilisa has been abducted by a Cloud Giant! But before he can face the giant, Perilous Jack must fight his way past the guardian of the giant’s castle – a Pyrohydra. But as everyone knows, when you cut off a Hydra’s head, two more grow in its place. Hercules used a torch to seal off the cut necks of the Lernaean Hydra, but that trick won’t work on a creature of flame . . .
Only a Frost Potion can help Jack past the guardian of the castle. And the only Frost Potion for miles is in a monster haunted labyrinth, under the guardianship of the terrible Bull God. A most perilous adventure! Flowcharts are practically required if you’re doing a Choose Your Own Adventure™ – style story. There’s no better way to avoid dead ends and illogical loops, plus they look nifty. I did this in Visio. 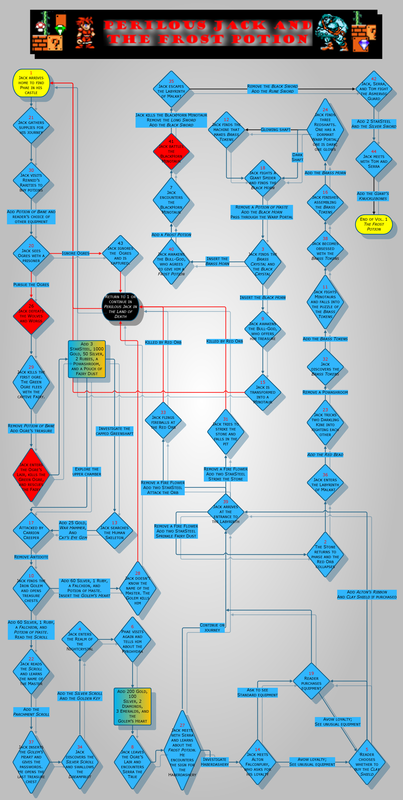 The full-size flowchart for Perilous Jack and the Frost Potion is here.